Fun colorful background animations triggered by the social nav in this One Pager for developer Matteo Belfiore. I write code for the web. I favour semantically structured markup, well designed CSS, accessibility, and component-based development. I have been trained in photography, film making, and graphic design, while my academic background covers new digital information technologies. 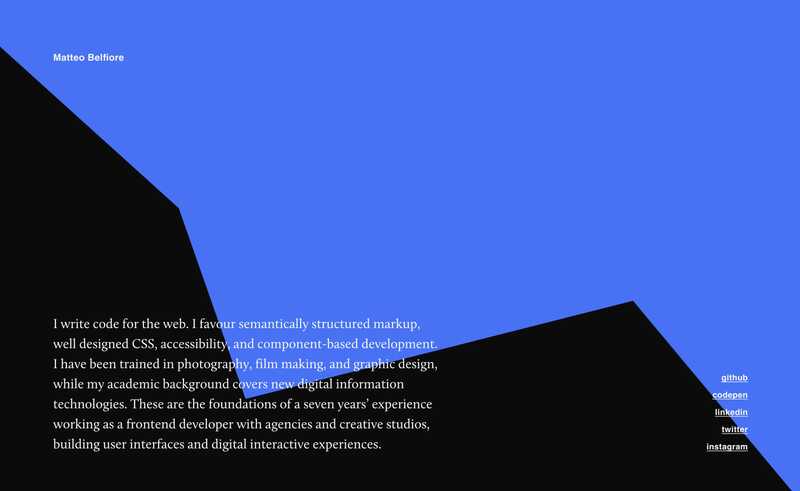 These are the foundations of a seven years’ experience working as a frontend developer with agencies and creative studios, building user interfaces and digital interactive experiences.